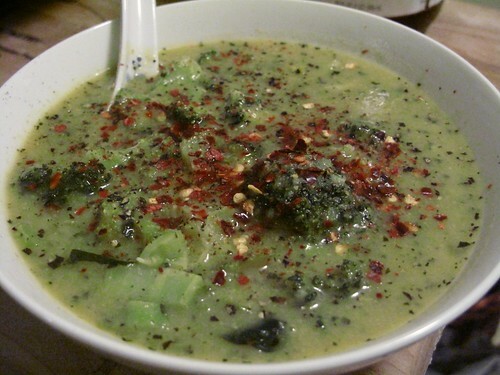 I threw this soup together from what I had on hand in the kitchen, after browsing several broccoli cheddar soup recipes online, all of which looked either too complex or simple (or pre-packaged) to me. Total cooking time was less than an hour, and it made at least eight servings, since the batch is so big I'm hoping it will keep well in the fridge & freezer. The only dishes you'll need for this is are a big heavy-bottomed pot and an immersion blender or normal blender. This soup was super served with red pepper flakes, sea salt, fresh ground pepper and a splash of golden balsamic vinegar. p.s. Not many pictures because this time of year it's always dark by the time I get to cooking, and the light in my kitchen is terrible. If you're curious about nutritional info, the soup comes in at 260 calories a serving, and probably tons of sodium, but lots of vitamins & calcium. Oh my. I tried my hand at this recipe tonight... Thank you SO much. Delicious and simple. Those pepper flakes kicked it up a notch. Awesome.